Hi all, this is my second attempt at the Master Dough without starter and I'm loving the process and results! However, I suspect that my dough is over-proofed and would appreciate any tips. Details below. Yeast: I used 4g instead of 4.5g (based on my first experience) of Fleischmann's ADY. Activated the yeast in 81 deg C water. Salt: Kosher rock salt (un-iodized) and manually ground fine. 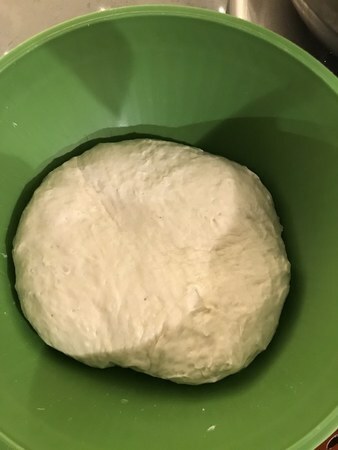 My first observation which triggered the over-proofing concern was how much the dough rose during the bulk fermentation (see attached pictures of the dough in the green mixing bowl). It looks like it almost doubled in size whereas the book says to expect a rise of 25-50%. 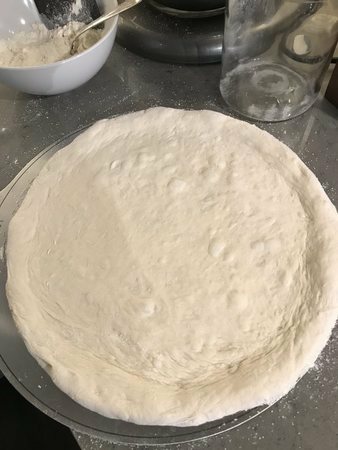 When balling the dough, I noticed that it was really sticky (picture attached), but this might just have to do with the high hydration %. It was better if I was quick with balling while the dough was still cold. 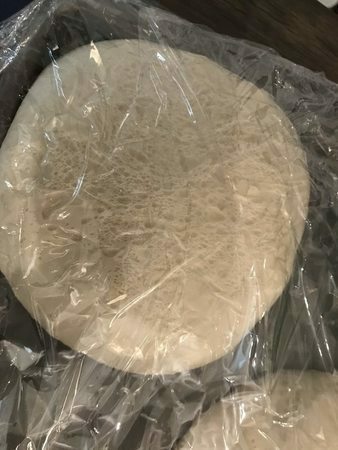 After the second rise, the dough seemed to have spread out quite a bit on the baking sheet and the surface seemed "dimpled" (see the zoomed in picture with the plastic wrap). It was also quite sticky but I think that's to be expected. It was definitely the most "tender" dough I've handled. Having had a similar experience before, I was careful while stretching and managed not to tear it. I did notice small bubbles forming on the stretched out dough (picture attached). Overall, the results were good. The cornicione was pronounced and crisp (I used dry malt extract this time) and the pizza was delicious. Looking forward to any feedback to improve my dough making skills! My dough and pizza look exactly like this. I love the flaky crust, I think it is amazing! I will be watching this to see the replies. I have to say though I consider this a huge success LOL. To help with the sticky dough I make sure the dough has oil and my hands are oiled. But honestly the pizza has a wonderful flaky and tender crust, I am glad I saw this!